I grew up on a cash crop farm in South Western Ontario, complete with a small orchard of peaches, cherries, plums and pears. Whenever I see a row of fruit trees, I feel a rush of nostalgia for my childhood. My father would not contemplate life without them and now I know why – the urge to plant fruit trees may well be genetic. 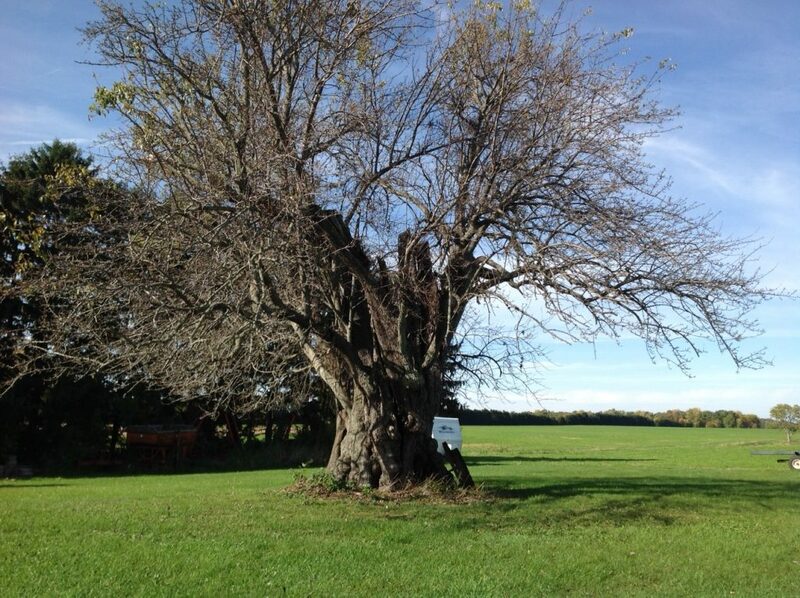 My French ancestors, who colonized the area which constitutes the Canadian/American border at Windsor and Detroit in the 1700’s, were the first settlers to plant fruit trees in Ontario, following earlier plantings by Samuel de Champlain at Annapolis Royal some time around 1610 (thank you for that, Heather!). With them, they brought everything they needed, generously bestowed by the beloved French King Louis XV. This included equipment, seed, trees, and animals. Nothing but the best for the new colony! Jesuit missionaries, who were great travelers, planted fruit tree pips wherever they went. 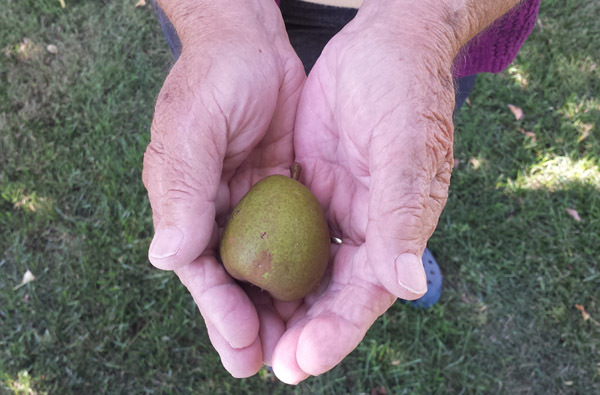 But the one defining tree was the Pear – every original French farm along the Detroit River had its share, as an epicurean connection to the home country. These trees were later called Jesuit or Mission Pears. A couple of years ago I was invited back to my home town of Chatham as keynote speaker for the release of a video about local Heritage trees. At the event, I was surprised to learn that a few Jesuit Pears still survive in small pockets on both sides of the Detroit River. What?! Pear trees that are 250 years old? Impossible! Enter childhood neighbour and passionate local historian, Dan Peltier, who offered to take me around and introduce me in person to three old timers on the Canadian side. The famous Iler Road Pear, mother of hundreds! We toured through the rich farmlands, sideroads and hidden driveways of Essex County to find these silent matriarchs. Never have I seen such big pear trees – in their present form they are diminished due to the vagaries of time but it’s easy to see that in their heyday, at over 60 ft in height, they might have given the local oaks and elms a run for their money. Jesuit Pears take 20 years to mature to fruit, so needless to say that, along with their discouraging height, they are not sought after in the modern orchard. However, the generous and reliable fruit, though small, is spicy and sweet, and the tree is resistant to pests. These characteristics make it a worthy addition to any breeding program. At the Harrow Research Station, 16 Jesuit pear clones are being preserved in the Gene Bank. 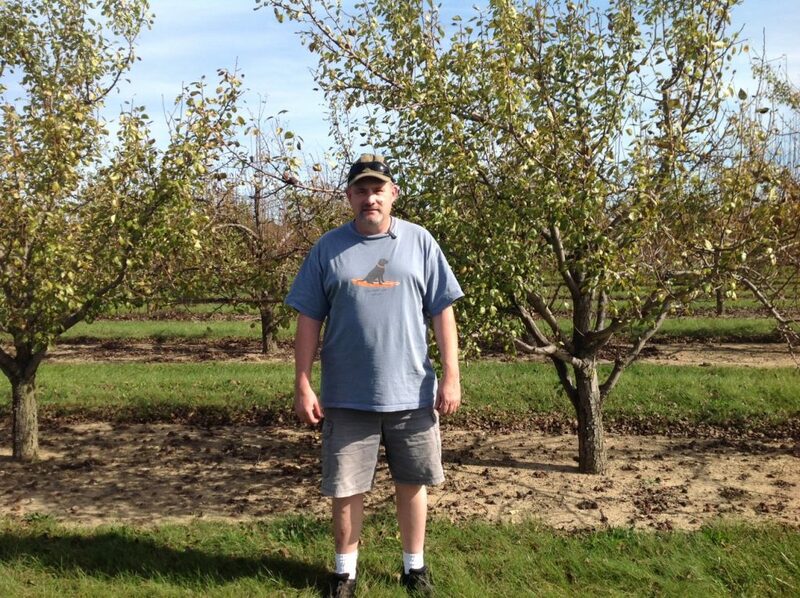 Martin Gadsby, Research Technician at the Harrow Research station in front of cloned Jesuit Pears. 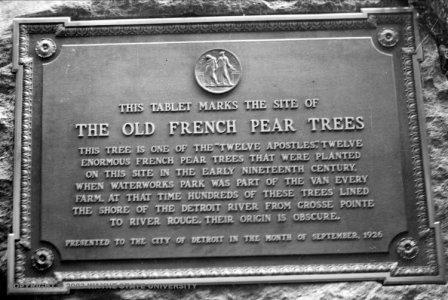 In subsequent research, I learned something else: one early 19th Century farmer in Detroit planted an orchard of 12, which later became known as ‘The Twelve Apostles’. The tree designated as Judas was set a bit apart from the others. Scroll forward to Detroit in the 40’s: there was a ceremony to plant new cuttings from the last remaining tree, the St Peter Pear, only to find out a month later that it was actually the Judas Pear. Consternation ensued! As a victim of further breeding in the motherland, this particular breed of pear can no longer be found in its original form in France. It suddenly struck me that the French language in our area parallels our Jesuit Pear history: many French words commonly spoken in Ontario decades ago are no longer used in France. Like these! I recall using some of these old words, or hearing them spoken by elders. No wonder the Jesuit Pear has been recognized as a living symbol of our region’s French speaking community. Easy to see that the Jesuit Pear is the coolest Pear ever. What can I do to honour it? 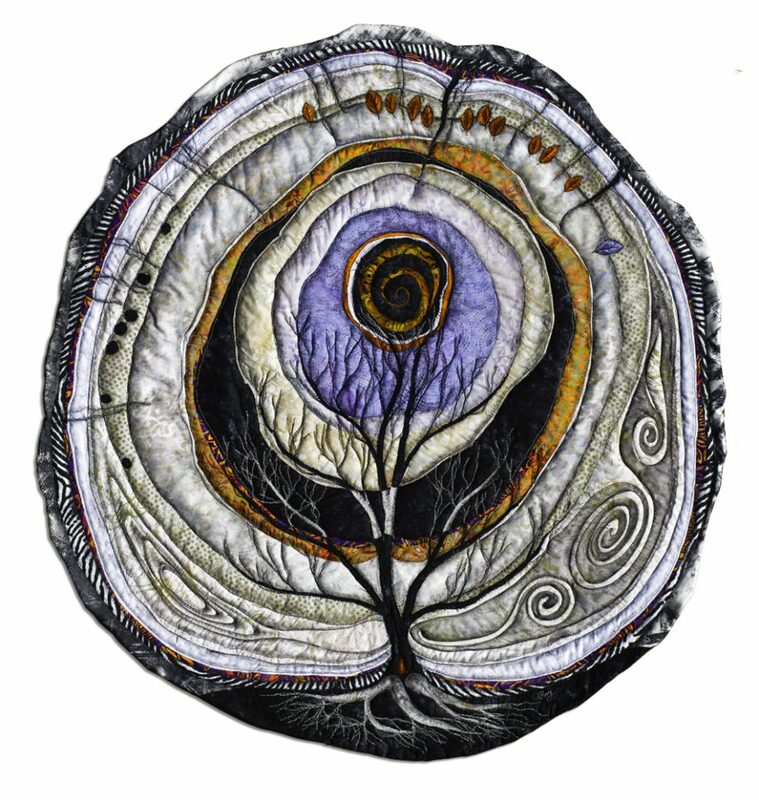 And so I begin with the idea of tree rings, which are visual markers of the passage of time. Below is a first trial which may lead to other larger versions. Fascinated by the story of the Twelve Apostles Pear orchard, I wonder, if not for Judas’ betrayal, would Christianity have taken its present form? I consider the idea that darkness can bring light. 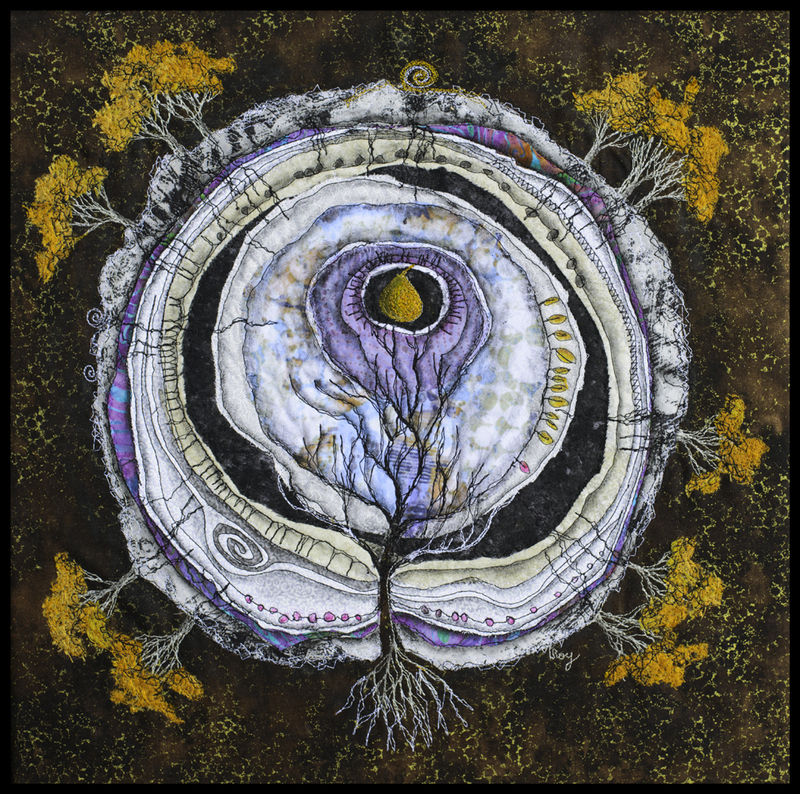 In the piece below, the 12th tree, the Judas pear, grows through to the centre – joining the outside to the heart. With this piece and with many others, I am exploring and embracing my attachment to my Roman Catholic roots… what it means to me now, as compared with my early training in doctrine. And another take on it…. this one a wall hanging. 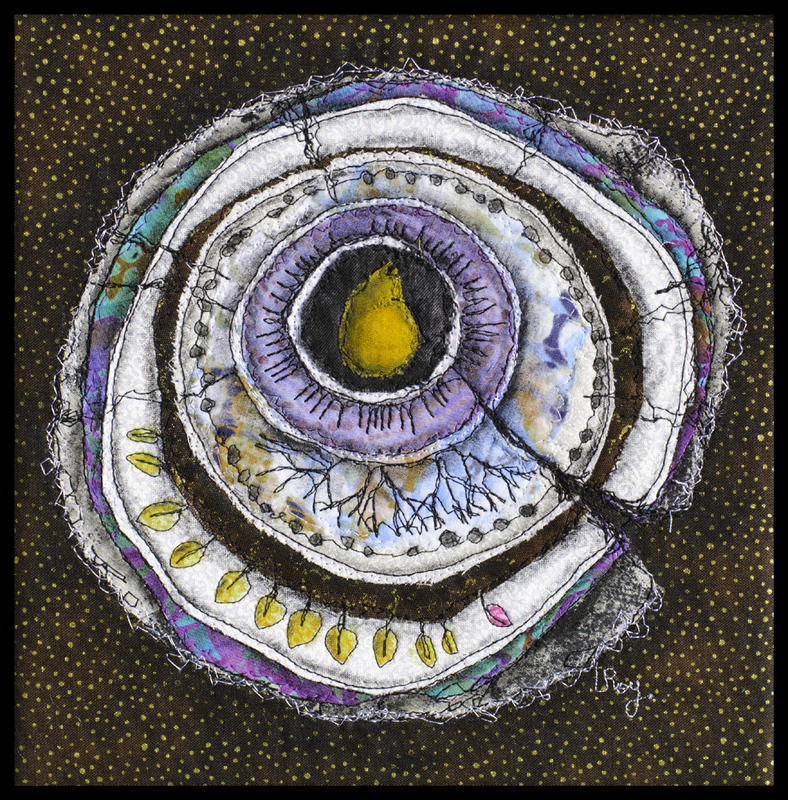 I intend to continue working on this series as fresh information and ideas come along. There is plenty to draw from its connection to my French heritage. And I’m imagining how its seeds and seedlings might have traveled to the New World in the pockets of the missionaries. Who knew an old fruit tree could be so… fruitful. Her twisting branches reached out and drew me back to my roots, in spirit, language, history, and HOME. By clicking on some of the images in this blog, you will be linked to the relevant research sites.